So did you like the bats from my last post? Weren’t they fun? I can’t wait to fill the ones I made with treats for my boys for Halloween. But that won’t be for a little while yet. 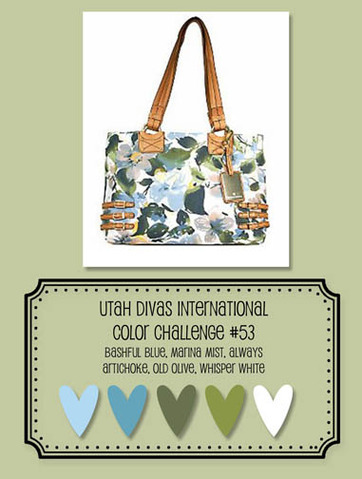 Now it is Tuesday and time for another UDI Color Challenge. Are you ready? Guess what week we are on? Week #53! What does that mean? We have completed a full year of color challenges! I can’t believe it has been a whole year. And we are starting year two….. I stamped the image with Black StazOn on Whisper White card stock and then watercolored it with my aqua painter and classic ink. Then i punched it out with the Scallop Circle Punch. Every image in this stamp set matches one of our punches and the images cover all the holidays/seasons – winter, Valentine’s Day, St. Patrick’s Day, Easter, Halloween, Thanksgiving, and Christmas. I wanted to frame my image with a mat of Always Artichoke – guess what fits perfectly – the Two Tags Die scallop tag. I cut one tag out with the Big Shot and then put it back on the die in the opposite direction so it would cut out a scallop circle to layer behind my punch. There is a square of Marina Mist card stock with a piece of the Letters to Santa Designer Series Paper on it. White Gel pen dots around the edge. The trim on the side is a piece of Bashful Blue cut with the Clear Scallop Square Die and the Big Shot and then trimmed off one side so I had 2 scallops wide strip. The Always Artichoke strip was cut from the Petal Cone Die and then run through the crimper. I tied White Baker’s Twine around them and tied a bow. I added some gel pen doodles on the scallops. That’s it. 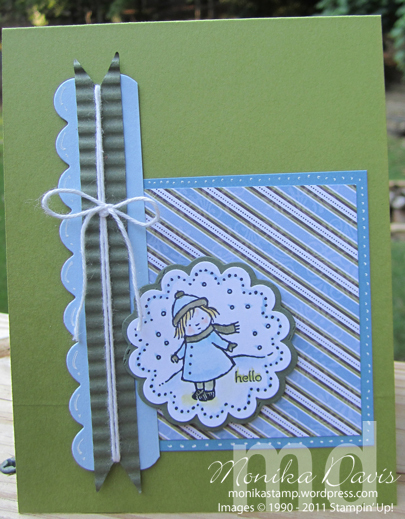 Accessories: Big Shot Die Cut Machine, Two Tags Die, Clear Scallop Square Die, Petal Cone Die, Crimper, White Bakers Twine, Scallop Circle punch, Aqua Painter, white gel pen. This entry was posted in Cards, Holiday Mini catalog 2011, UDI Color Challenge, Watercoloring and tagged Big Shot, Holiday Mini, Monika Davis, Stampin' Up!, Watercoloring. Bookmark the permalink.